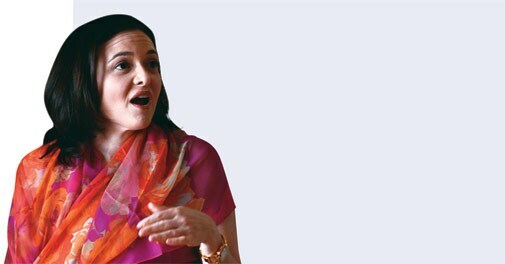 Sheryl Sandberg, Chief Operating Officer of the world's largest social media platform, Facebook, has 100 million users in India. She wants a billion more. Q. What is Facebook to Sheryl Sandberg? A. Facebook is the power of technology behind real people, real identities. I am old enough, more than many people in Facebook are. I remember when the Internet… I was here before the Internet... It was unthinkable to put your real identity on the Internet. I believe that if we knew everyone and if everyone was connected, there are only real people with real identities. Real identity is such an important part of it. This [India] will definitely be our biggest market - depends on how quickly people get online here - for people. Q. How much of that is Facebook? A. Obviously, it is not one company and there are many companies who have worked on it. But I think Facebook by far is the world's leader in real identity. Q. How has your definition of the Internet changed since you left Google? A. I am a big believer in Google, what it has done and what it continues to do. When I was at Google, I started and ran a bunch of operations. The reason I went to Facebook was real identity. Facebook wanted you to put your real name and your real picture. Why do we let children die of unclean water all over the world? Because we do not know who they are. If we saw their names and saw their faces, we would not let that happen. It's really hard to shoot [someone] if you know who they are. Q. Is it causing a dent in any way to the biggest problems of the world? A. I think so. There is a lot to do in the world, and I don't think Facebook, or one company, or one person… but you know there are so many great stories of things that happen. My great-grandfather had a paint store. He would notice some paint chipping, and his marketing was that the paint was chipping so it was time to come and buy a can of paint. It was very personal. And then with the advent of mass media, with radio and TV, people did mass marketing. And mass marketing is one message to a large number of people that speak in one way. That is very different from personalised message where there is two-way dialogue. We do personalised and we do it two-way. Everything on Facebook is two-way. In the long run we will more than cover our cost. In the long run I think it [India] will be an extremely profi table market. Q. How important is India to you? A. It's really important. This is our second-largest market. We have 100 million users… but here there is another billion people who can come online. We only have four global operation centres and one is here. So we are doing work which is contributing to the India market and to the world. Q. What does all this mean for Facebook? A. Our ambition is to connect the world. A huge part of the world is here. Our mission is to connect businesses and tons of businesses are here. It's an integral part. The India I knew in 1991 and the India I know today, it's unbelievable and you wouldn't have predicted. India is a huge part of the global economy and has a huge potential to continue to grow. Q. Do you think this can be your biggest market by users? A. I think in the current trajectory this will definitely be our biggest market - depends on how quickly people get online here - for people. Obviously, feature phones are big here and we have worked hard to make our products available on feature phones. We have now had advertising campaigns that have gone on feature phones. Q. Why was there a pivot to mobile? Mark [Zuckerberg] has said if he had started Facebook three years later, it would have been a mobile company. It would never been a desktop company. We were a desktop company and we saw the people move. Here people just skip the desktop and move to mobile phones. So it is quickly becoming the way they consume content, that's the way people consume media, that's the way people connect. We would not be where we are if we continued to build for the desktop. Q. Was there an Aha! moment? A. We were watching the usage and the numbers and it was so fast. However fast it was every week and every month, it was faster the week and month after… and it made sense. We don't have a PC engineering team anymore. We took almost all of our engineers - 600 of them - and placed them in training boot camps. Q. Is it Facebook's ambition to be the world's largest targeted-ads company? A. Our objective is to connect the world and a large thriving ad business helps us meet that objective. Certainly we are on our way. Q. Can India sustain on its own? A. In the long run, we will more than cover our cost. In the long run I think it will be an extremely profitable market, not just for our company but for any company which will be smart enough to invest here. Q. There has to be a country-specific P&L. A. The way we run Facebook is that we do forward-looking investment. Not just country by country, but in general. We do it with our products. We put consumer products out there, we let them grow and then we monetise later, and we fund that with monetising our current product. We bought WhatsApp - the deal is not closed yet, but we have no plans to monetise it anytime soon. A. We are aggressively investing here because we believe this is a big and thriving market, both for consumers as well as our advertisers. Had you not moved to mobile, would India be so big for you? No, had we not moved to mobile, India would not have been so big. A. See India is where we make those investments. We are really committed to get that next four to five billion people online. And the next billion of them are going to come from here.